Save the date! Snappy Nappy returns to The Portal in Manchester,. Connecticut for another Campaign in a Day event, to be held Sunday, April 23, 2017. Time will presumably be 10AM - 5PM as in the past. This outing Dan Burkley will be the GM. Dan already has all of the maps, OOB's etc, prepared. We will be using 15mm figures from Dan's collection. On April 10, 1809, Archduke Charles and Archduke John initiated their campaigns against Napoleon on Germany and Italy, respectively. By early May of 1809, the Austrian offensive in Germany had already stalled out. Archduke Charles sent orders to Archduke John to fall back and bring his army in supporting distance of Charles’ army. Archduke John had scored one success versus Prince Eugene at Sacile in April. Historically, he pressed his luck by continuing the Italian offensive, but eventually faced reality when he recognized his army of under 30,000 (from leaving behind garrisons and outposts along his advance) was inferior in numbers to Eugene’s Army of Italy after receiving reinforcements as it fell back into Northern Italy. 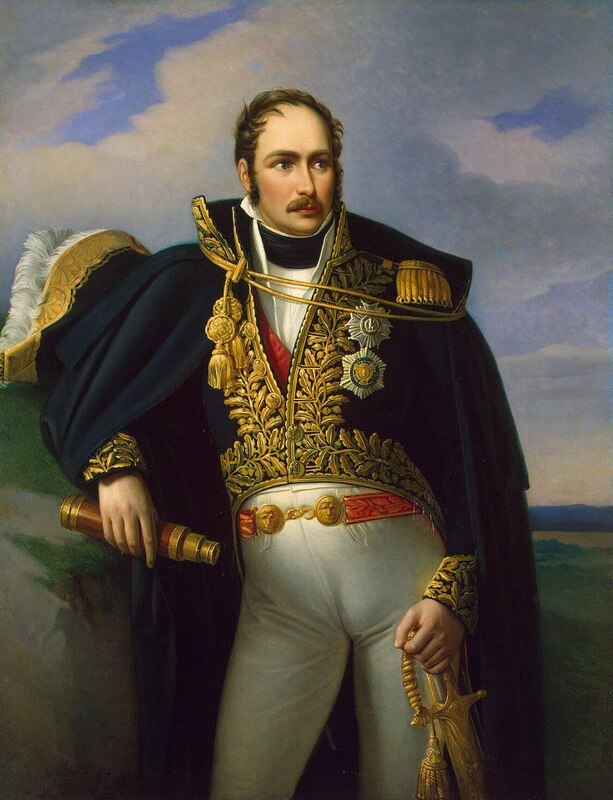 Eugene recognized this as well, and went to the offensive, aggressively bringing the battle to the Austrians as they tried to retire back to Inner Austria, inflicting several defeats and fulfilling all of Napoleon’s orders. This “campaign-in-a-day” explores the options that Prince Eugene and Archduke John have starting in early May 1809, but the players will re-write the history Commands will be division-sized. The playing pieces will represent approximately 1500-2000 men, 500-750 cavalry, or 2 artillery batteries. It's not too soon to start to let us know who wants to participate, and any preferences for side or command, and if you want or are willing to serve as the C-in-C for either side. Email me: GonsalvoATaolDOTcom for questions, or to sign up! There is abundant information and past accounts of our past Campaigns in a Day on this blog - just Click on the Snappy Nappy Label and work backwards through the posts. These British Hussars are the second unit off the painting table for 2017. The 15th was the first complete unit of Light Dragoons raised for the British Army, dating back to 1759. In 1760, as part of the British involvement in the Seven Years War in Europe, this inexperienced regiment was sent to Germany, where it was the only British unit in a command lead by the Erbprinz von Hessen Kassel. The remainder of the force was composed of Hanoverians, Hessians, and others. On July 14, a day which was exceedingly hot, the Allies launched a surprise attack upon the French forces under Marshal Glaubitz, who were encamped on the plains outside of the Town of Emsdorf, located in Hesse. The !5th LD charged the French a total of three times, allegedly capturing 5 standards, 9 canons, and 1600 prisoners. Presentation of the trophies at Emsdorf; note the kettle drummer! As a result, the Regiment was later granted the title, "Kings" by King George II in 1766, and became a Royal regiment, with its facings changing from green to dark blue. It was also the first British unit to be granted a battle honor, "Emsdorf". It received a badge of a trophy of arms to commemorate the events. It also acquired the nickname of "The Fighting Fifteenth". The regiment suffered the lion's share of the Allied losses that day, 125 men, including six who died of heat stroke! The regiment continued to serve in Germany until the end of the Seven Year';s War in 1763. In 1784, all Light Dragoon regiments changed to wearing blue coats instead of red, and the facings of the 15th were thus changed from blue to red as well. the Regiment next saw service abroad in 1793, when part of it was sent to the low countries under the command of the "Grand Old" Duke of York. The regiment was almost constantly engaged in scouting and skirmishing duties, including a notable action at Villiers-en-Couche (near Cambray). 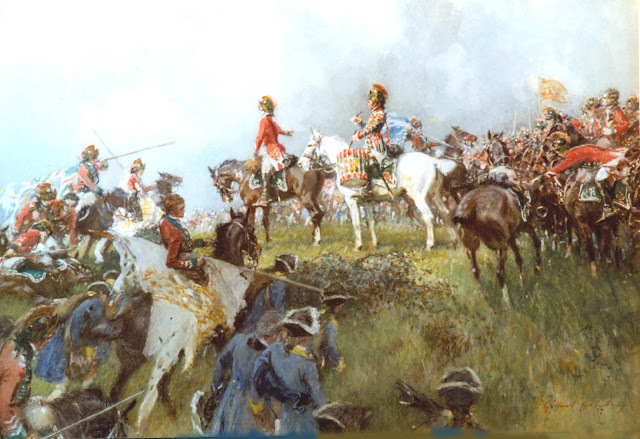 On 24th April 1794, they, with a regiment of Austrian hussars, charged a large body of French Cavalry. It turned out to be a trick and when the cavalry moved to one side a battery of artillery was revealed. But the French guns misfired and there were few casualties - at first. They charged into French Infantry who were dispersed. One outcome of the battle was a lasting connection with Austria. The Emperor Francis II gave a gold medal to each of the officers of the regiment and later presented them with the Order of Maria Theresa. Also the gold lace worn on officer's uniforms and horse furniture was, in future, woven in the Austrian Wave pattern. Two weeks later, on 10th May 1794, at Willems, the regiment broke several French infantry squares. It was the first time the French had used that formation. For some reason the battle honour WILLEMS was only granted to the regiment in 1909. They also fought very bravely at the battle of Tourcoing, saving the army from a complete disaster. It was a defeat, however, so no battle honour was granted. (Account from 15th - The King's Light Dragoons Overall, of course, this campaign was a failure, and the 15th was among the last troops to depart the Continent, in December 1795. The 15th returned to Holland in 1799, as part of another expeditionary force under the Duke of York. On the 2nd October 1799 a general attack was made on enemy positions at Bergen and Egmont-op-Zee , and battle was joined with a strong French force whose Infantry were in the sand dunes, and Cavalry and Artillery on the beach. 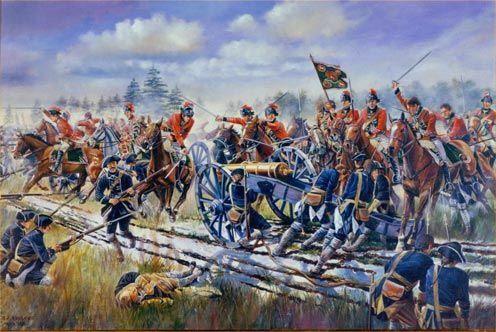 The enemy were forced back for several miles, eventually halting before Egmont, at which the British Artillery moved forward to check the French guns. Paget moved up two troops of the Fifteenth to support, keeping them concealed in the dunes. 500 French Cavalry moved up against what they thought were unprotected guns, pressing forward despite casualties from the fire of the Artillery, but were surprised and driven back on their reserves by the two troops of Fifteenth, who then returned to the liberated guns. The French Cavalry rallied, and, seeing the small size of the force set against them, returned to attack again. 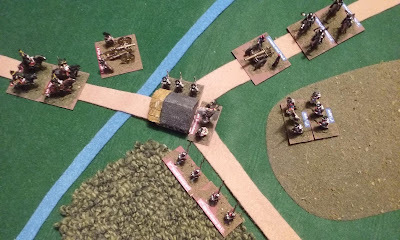 As they reached a point within forty yards of the Fifteenth the third troop came up, and a determined charge by all three troops drove them back again, and pursued for more than half a mile. (Account from XVLB - the Website of the 15th Light Dargoon (Hussars) Re-enactment group) Despite these individual successes, overall the operation was a failure yet again, garnering scant support from the Dutch populace, and the expedition returned to England after only 6 months. In 1807, the Regiment was converted to Hussars. The change was championed by the Prince of Wales, supported by the King's 5th son, the Duke of Cumberland, who had been Colonel of the Regiment since 1801. This is the uniform that I have painted this famous regiment in. At this time, the 15th had brown busbys with red bags, red facings, and white lace. The fur on their Pelisses was black, except brown for officers. the lace and buttons were white - silver for officers. The King's Guidon of the regiment has a dark blue field, being both a Royal regiment and having red facings, with the King's cipher surrounded by the blue garter in the center of the field, as the badge of the Regiment. I've painted this unit with the grey trousers and red seam stripe typically worn on campaign. In 1808 the 15th departed for the Iberian Peninsula, and landed at Corunna in November 1808. The regiment was part of an expeditionary force of 17,000 men under Sir David Baird, who were to link up with Sir John Moore's army. The commander of the cavalry was Lord Paget, later known by his title as Lord Uxbridge. The regiment had 8 Troops of 85 men each. The 15th led Baird's force to the rendezvous with Moore, at Mayorga on the 19th of December, 1808. On the 21st December, the regiment's most famous battle took place at Sahagun, 18 miles north-east of Mayorga. 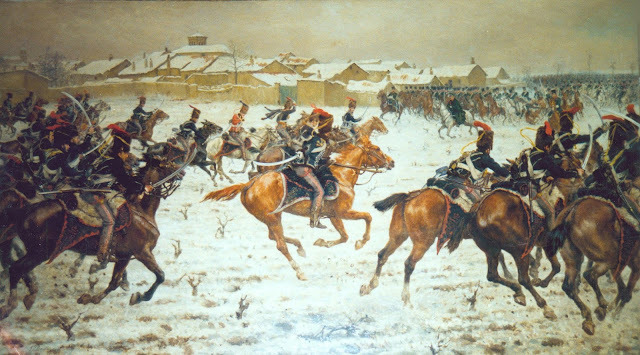 In this action, the 10th Hussars moved to confront the French cavalry on the north side of the town while the 15th approached from the south to cut them off if they retreated. The 10th were under the command of the unpopular Brigadier Slade who hesitated as the French dragoons started to withdraw, so Lord Paget ordered the 15th to charge. They were glad to have some action, as they were frozen. They had to charge uphill, over a ditch and across broken, snow-covered ground. The French Chasseurs a Cheval and Dragoons remained stationary for some reason, and only fired a few shots at the 15th. The impact of the charge was terrifying. Men and horses were bowled over and slashed with sabres, shrieks and swearing clearly heard above the din. After ten minutes, the French broke and fled, leaving many dead or dying. Out of 420 Frenchmen only 200 escaped death or capture. 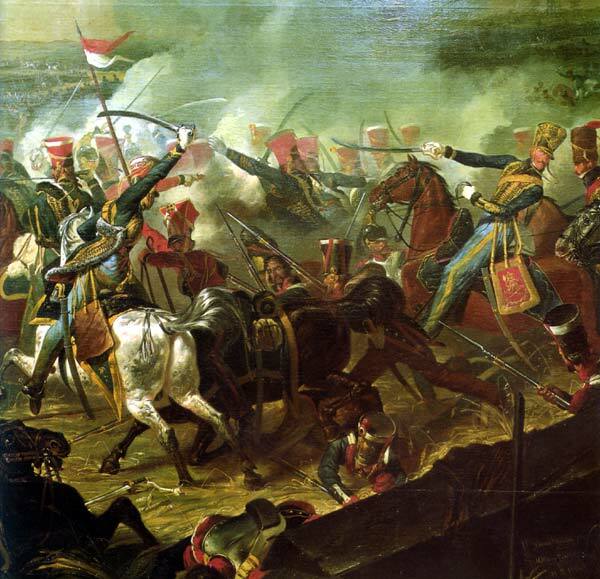 The 15th Hussars casualties amounted to only two killed and 23 wounded. 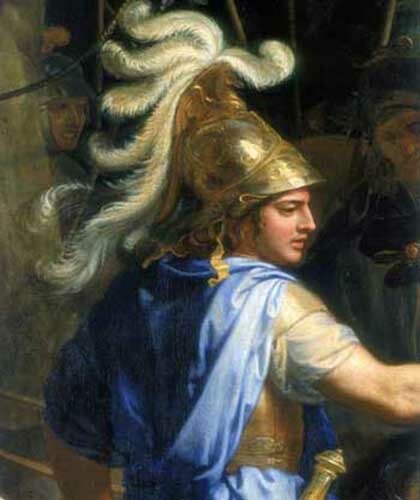 The head wounds received by the hussars were much worse than those of the French Dragoons who wore brass helmets, and the Chasseurs whose fur caps were reinforced with iron hoops instead of the pasteboard used in British hussar fur caps. Ultimately, Moore's force had to make a famously difficult retreat back to Coruna in January, 1809, where the regiment was re-embarked, but had to destroy all but a handful of its horses to avoid them falling into French hands. Sir John Moore himself was killed at the battle of Coruna, fought to cover the re-embarkation of the British forces in Spain. The regiment was then stationed in the United Kingdom until late 1812. 'Twas the Fifteenth Hussars, who had never known fear. To tell the French there that the English had come. With three cheers from the fifteenth the vineyards did ring. They turned threes about, and away they all fled. Three hundred were taken, the rest of them fled. 'Twas the Fifteenth Hussars made those Frenchmen to yield. Crying, 'long live the English, and down with the French! Although they then numbered eight hundred or more. We'll drink and well sing now the battle is o’er. In 1813, the regiment adopted scarlet shakos. The Busbys may have been restored prior to Waterloo. Once again, these are 28mm Old Glory figures with GMB flags. The Regiment returned to the Peninsula in February 1813, landing at Lisbon. It participated in many of the actions of the later Peninsular War, including Burgos, Vittoria, Pamplona, and Tolouse. The British Light Cavalry at Waterloo. 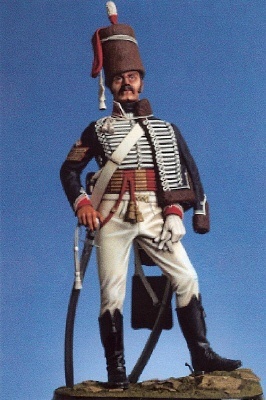 A finally detailed collector's model of the 15th, wearing the uniform that it wore at Sahagun (white pants were worn for full dress by all of the Hussar regiments). 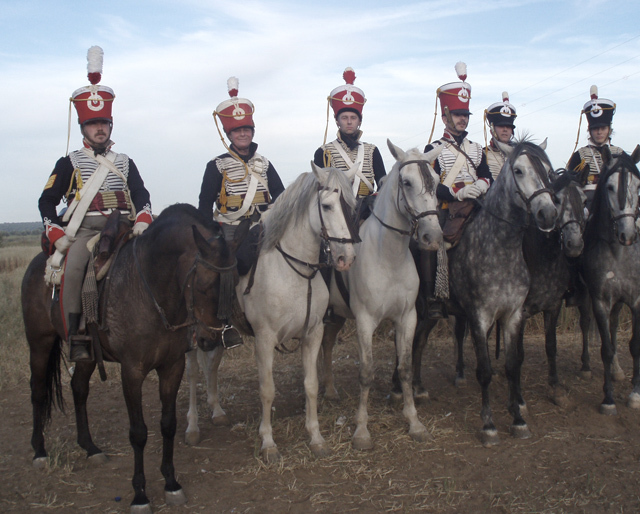 Modern day re-enactors of the 15th King's Light Dragoons (Hussars), here seen wearing the later scarlet shakos. Trotting off the painting desk is the first completed unit for 2017, the 10th (Prince of Wales's Own) Light Dragoons (Hussars). This Regiment was first raised as Dragoons in 1715, during the first Jacobite Rebellion. It did not contest that, but did participate in the suppression of the Second Jacobite Rebellion of 1745. It was sent Germany in 1759 during the Seven Years Eat, and fought at Warburg in 1760, before returning to England. In 1793, it was converted to Light Dragoons, and titled as the 10th (Price of Wales's Own. It was one of the most prestigious units in the army due to its connection to the royal House. 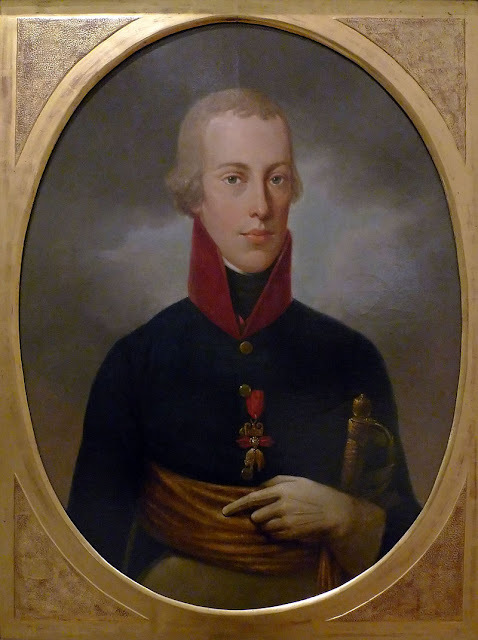 The Prince himself became colonel of the Regiment in 1796, and took an active role in its affairs. He remained its colonel until his coronation as King George IV in 1820! The Price of Wales renamed and re-equipped the Regiment as Hussars in 1806. At that time it had yellow facings with white/silver lace. It was sent to the Peninsula in 1808, and covered the retreat of Sir John Moore's army to Corunna in 1809. In the process, it fought at Benavente, capturing French general Lefebvre-Desounettes. This is the uniform that I have chosen to paint my version of the unit. Being thrifty I have used the squadron color of the 15th (King's Own) Hussars, which will be up for review next, as the King's color of the 10th. The only differences would be the badge of the Prince of Wales would presumably be the central device, replacing the Union sprig, and the number in the ovals. The King's color was crimson, unless the regiment had the "Royal" designation, in which case it was Dark Blue. Squadron colors had a field of the facing colors, except for Royal regiments in which they were red. So the 10th's squadron colors would have had a yellow field. Confusing enough? No? Well, in March 1811 it added the "Royal" designation, becoming the 10th (Prince of Wales Own Royal) Light Dragoons (Hussars) - quite a mouthful! This required a change in its facing color to red. Hamilton-Smith shows an NCO of the regiment in "Review order" at this time, with a red shabraque with white lace edging and vandyking. That would have changed the regiments flags to one blue King's color and several red colors, one each for the 2nd, 3rd, 4th etc squadrons. I have given the trumpeter a grey horse, but the British didn't follow that practice (and also docked the tails of thier horses). The 10th returned to the Peninsula in 1813, and continued on with Wellington into the South of France in 1814. It was re-equipped with Scarlet shakos in 1813, and when re-clothed in 1814 it now had blue collar and cuffs! It fought again during the Waterloo campaign in 1815. The motto of the Regiment was that of the Prince of Wales, "Ich Dien" ("I serve"), and its nickname was "The shiny 10th"... perhaps the origin of the distractable wargamer's exclamation, "Oooh, shiny!"? With 2016 now firmly in the record books, it is time to turn my gaze to the future, and consider my hobby plans for the coming year. It looks to be the Year of the Ancients here on the "Danube"
I really want to try to hold my hobby expenditures to $1,000 or less for 2017. I think this is doable this year, as I have a rather impressive backlog of lead to paint (for me, at least), and nothing pressing that I need to buy for my 2017 plans. 1) Finish our Lannes Napoleonic "Campaign". This has been a lot of fun, and bar the unexpected, should be no problem. As intimated above, I anticipate not buying much in the way of new figures this year. At one point, my plans for 2017 included starting my Spanish Napoleonic army, but I think that is now on track for 20018 instead. I do have a modest amount of lead already on hand for that project anyway, should I feel like starting it. Other than that, it's hard to think of much that I will need to buy this year, aside from a few minor additions to my British Napoleonic forces, and the elite companies of the 4 bicorne wearing French Ligne regiments that I painted this fall, and there is nothing pressing about either one. If my purchases stay low, I might flesh out the rest of the lead for my Eureka Tyrolian Rebel project. Of course, If Murawski releases Baden Light Dragoons and or Artillery, they will soar to the top of the "Must Have" (and must paint) list. I do want to buy most of the existing Rawkins uniform E-books, but there is nothing pressing about that either. 1) Finish the existing British Napoleonic troops on hand - maybe by the end of January! 2) Refurbish and base the Canaanites that Ken gave me last year. Paint some of the bare metal lead included with them as time and motivation allow! 6) Great Italian Wars - The Essex Gendarmes, and maybe a new Pike block (Lead for all on hand). 7) Consider starting the Tyroleans in the Fall of 2017. Keep about the same pace of posting as I have the past 2 years. Work on the Renaissance Galley rules. It looks like that might be a post Historicon project. With Historicon moving much closer for 2018, that would be a good year to run a Sunday AM Renaissance Naval game! No actual pies were harmed in the creation of this post! This was way more than I really wanted in terms of product, but it is one that I really believe in, and wanted to see successfully funded, so I supported it heavily with both publicity and funds. I now have a boatload of great terrain pieces on order; I plan to give a substantial portion of that to Jared in support of his Middle School game club. For comparison, my total for 2015 was 3,160 (not counting terrain, markers, etc). Notably, that was 100% 28mm Napoleonics, chiefly driven by the huge Ligny game at Historicon that year. Almost half of the figures painted that year being Napoleonic Prussians; that category is conspicuous by its absence in 2016! Napoleonics still accounted for over 50% of all the figures painted in 2016, but the Hussite Wars project came in second. That is an essentially complete project now... or so I claim! No additional surveys taken... I plead personal weakness there. We'll see if we can't survey at least one more sub-location of unpainted lead in 2017! Some moved out of Part 1 Census stocks this year (Perry and Old Glory HYW figures). The Russian figures all came from the depths of another sub-location of long term unpainted, lead, however. The majority of lead purchased in 2016 was painted in 2016 as well. May: The Winter 1807 Campaign with Snappy Nappy. July: Assyrians vs. Egyptians with To the Strongest! July: Hussites vs Catholics with TtS! July: The Engagement at Klagenfuirt 1809, with Piquet, Les Grognards 2nd edition. 7 games played, 5 games run, averages out to one a month, which is my goal. 88 posts, a bit less than 2015 and 2014. 204,552 Page views for the year (but hard to asses due to large numbers from amount by Russian/Ukrainian bots, it seems - probably about 80,000! And The Donald doesn't believe our own intelligence agencies that the Russian Government is involved in hacking on a grand scale? Ha!). The Blog exceeded 600,000 page views all time as of late December, 2015. Amazing, but see the above! I need to update the links in the Napoleonic Painting guides section again with the posts from the past 4 months. None. We might take up a Snappy Nappy campaign booklet(s)... or not!